Welcome to Geniusknight Hunger Games! 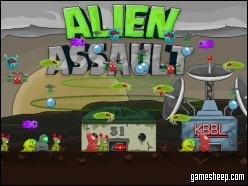 Alien Assault Shooting Game is a popular online game which has a very uncanny similarity to popular games like plants vs zombies, defense tower games, etc in terms of handling and gameplay. The games is great fun among those who love defense tower type games. This game is also one of the Popular strategy defense tower games on the Internet. Just make sure to destroy all the alien waves on time before they could reach your tower. Be aware to place your soldiers in correct positions and range strategically so that their firing can reach the enemy and destroy them. Be aware you can't place your soldier anywhere else except on the Tower. Take command of your little soldiers commander and decide where they will shoot as all hopes of Humanity depends on you. Hold the mouse on the soldier to drag it from one position to another. Hold the mouse on Soldier to choose various combating skills for the soldier. Easy (Gets tougher with Increasing Levels) Be aware to place your soldier in correct place and range to destroy all the Alien waves successfully.